Robotics is being used in Medical field to perform surgeries from quite some time and why should dentistry be left behind. Neocis, a company based in Miami, Florida has announced that their robotically assisted dental surgical system “Yomi” has been cleared by FDA. 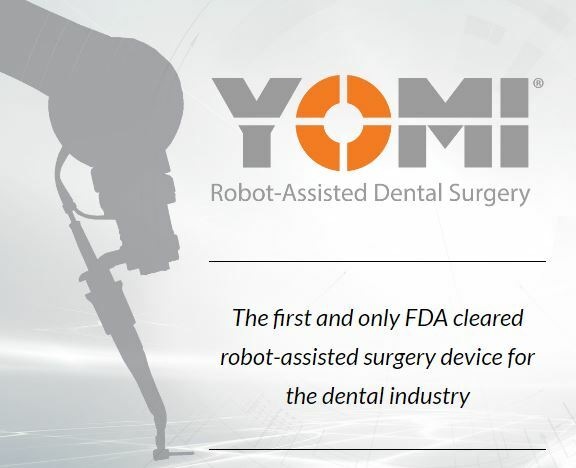 The company has designed Yomi to plan and assist the dentist during the procedure based on the patient’s CT scan. The system is designed to continuously keep track of the patient and has control over the direction of the drill even when the Dentist is advancing into the tissue. The system will be keeping an eye for any mistakes or when the clinician strays from the location and it even keeps track of the depth and the orientation of the plan decided. All this is being monitored while having control over the actual drill delivery with Physical guidance by a collaborative robotic arm. Neocis says that the software is designed to allow changes in the treatment plan in the middle of the procedure if the need arises with a Real-time 3D graphics in Visual Guidance. With the use of surgical guides the scope of altering the procedure is difficult mid-procedure which is possible with this software. The clinician has great visibility and space unlike in guides where the view is obstructed by the surgical guides. One of the major advantages of Yomi is that there is no need to wait for days to get the guide fabricated and return from the lab, the procedure can be planned and executed directly in the Dental clinic decreasing the time taken. When you get the Handpiece into the right position, it locks in this position and all you have to do it step on the pedal and start the drill, once you reach the desired depth the system stop you from going further. This in a way gives a reassuring hand or an invisible hand guiding us through the procedure telling us when to stop and when to proceed. Check out the Clinical Video of Yomi is action and see how it works in a clinical environment without the need for a surgical guide or of having to do free hand implant placement which might lead to many mistakes. Can you please give me your email id or mobile no. so that I can discuss about my dental problem and better solution as I am afraid of surgery due to its trauma. Is Sensitivity after Tooth Filling Normal ?